Follow these before, during, and after instructions to keep your family safe in the event of a Winter Storm. that is higher than the average snow cover depth for your location. This will increase the odds of it being seen by someone such as a snowplow operator, reducing the chances for a potentially fatal accident. If a winter storm is predicted, listen to your local authorities, or television and radio stations, for instructions on the appropriate course of action to take. Although it is recommended to always have an adequate supply of propane in your tank, it is especially important during the winter months because in the event of a storm, roads leading to your home or farm might not be accessible for additional delivery. Snow and ice can create serious problems for your home’s propane system by freezing and cracking pipes, regulators, valves, or other types of propane equipment. poisoning. Whenever possible, use a broom instead of a shovel in order to not damage your propane system components. After a winter storm, use caution in the area surrounding your home or farm. If you have any doubts about your safety, leave the area immediately and have your property inspected by a qualified building inspector or structural engineer before re-entering. Take the time to carefully evaluate the condition of all the structures on your property. If it is dark, use flashlights, not candles. Look carefully around the entire area. Check for downed power lines; they can create major safety hazards. High winds or falling ice can move, shift, or damage gas lines and tanks. 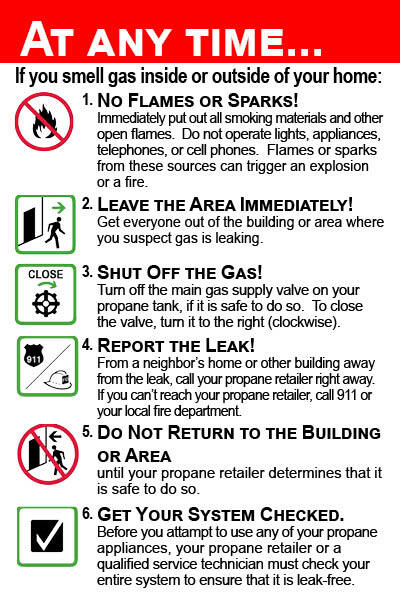 Immediately call your local utility company or propane retailer if any of these hazards exist. your household appliances while standing in water. This can result in electrocution.